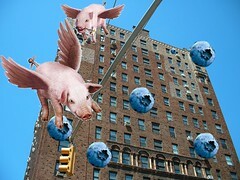 Guuye ~ Гүүеэ - If Pigs Could Fly! Comedy Curiosities Did you know...? ‘Willie, can you come here, please?’ called this woman across the hotel reception area where I worked. I couldn’t believe what I just heard. I quickly ran into the tiny staff room. I was so embarrassed and didn’t know where to look. I hoped nobody heard that. What did she just say?!! She said ‘Willy’ the rude word! I was giggling inside, almost burst into laughing. Who would’ve thought my son would be called Billy another version of William then. That was eight years ago. Like that, my stories of adjusting to British culture continues. Once I was offended by a waiter whose thumb was sticking out between his index and middle fingers. That was very rude! It’s a bit like sticking your middle finger up really. That rude. I couldn’t see his face, I couldn’t explain what he was doing, not that I was going to explain it. It was hilarious for my husband who knew exactly how I was feeling. Then there is the idioms and sayings which I love learning. Not long after I arrived in Glasgow, my mother-in-law taught me the phrase ‘Nothing. Not a sausage.’ My reaction was: A sausage?! Why? Why not a… erm .. a … a pancake?! One of my favourites is ‘A sleeping policeman.’ I’m rubbish at remembering it. It often comes out as ‘The dead policemen.’ Surely, after driven over it do you expect it to be ‘alive’?! Again and again?! Ooh, now bring on the translations. It can be hard to translate idioms. I mentioned before ‘Chalk and cheese’ would be ‘A camel and a goat’ in Mongolian. You can not get your message across if you just say the words chalk and cheese. Ha ha yes it does all sound funny when you see it written down. When I was young and the world was a much larger place as no one went to other countries for holidays my mum used to say if I had been out for a long time, “Where did you go to get that? Outer Mongolia” She used that expression all the time. I have a Pakistani friend who was chatting to her husband on the phone in Urdu and then I heard the word ” mayonnaise” and it sounded so funny but apparently there’s no Urdu word for it.